My blog for anything PSP design related and the ocassional ramble. PSP Resources include FTU/PTU items as well as freebies!!! rather than a celebrated holiday. This is not to say we don't observe Labor Day, we do just not in the go all out bang up celebration style. So, my attentions have turned towards fall and halloween...oh yea!! halloween...I love this holiday!! It always brings out so many creative styles and it's just around the bend too! Stef and I got together again to make some templates for you all and we used Halloween as our theme. Big thanks to Stef for collabing with me and I look forward to our next session! The O’Scrap “Time For School” BlogTrain is leaving the station!! Gorgeous Previews shown below from all the designers. I made a PU Tagger Size kit for you all to play with. Please be kind and say thank you for any of the wonderful creations you download! 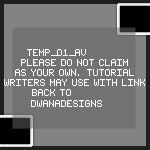 Check out my tut Retro Glamour that this tag came from. for summer that we'd love to share with you all. I had a great time doing these templates with you, Stef. I look forward to more in the future. Be sure to stop by Stef's Blog and leave her some love as well. Here's a recent template I made for a forum I am a member of called BlamALicious. however I do not worry over the way I design the headers...Dwana Designs works just fine for me. The name D'wana Designs comes from a joke around my house..we often say to one another "Da wanna design now?" hence Dwana Designs. I design scrap kits, tagger & full size, also share templates for tags and various resources for the tagger to make a signature tag with. Now, I am not as fast as many of the scappers I see designing in the PSP community however I am persistent! I love to design and will continue on regardless as to what must be acheived to do so. I am currently learning how to create scripts of my own to sell in the psp community. On this blog, you will find freebies as well as advertisements for my PTU items and probably some random babbling from me. The items will begin to compile soon, so be on the lookout! Like what you see? Follow me please.